Most wolf biologists have encountered hundreds of wild wolves in their careers, and in that process, many have become witness to the intimate lives and fates of a select handful of individuals. Over the years, these biologists have occasionally shared stories of their ‘favorite’ wolves with one another, often over drinks at the local pub during wolf conferences. Few outsiders have been privy to these stories—until now! This is a remarkable collection of tales spanning the globe, from the earliest studies to the present day. Wild Wolves We Have Known tells the stories of individual wolves through the lenses of those who know them best—the biologists who have studied them. Immerse yourself in the fieldwork; observe the challenges facing the species, and bear witness to the extraordinary resilience of these remarkable wolves. “A book such as this one, should be required reading for anyone interested in observing the behavior of and learning about another species.” Debbie Reynolds— Board Chair of Audubon Minnesota. “These stories are more than words on a page. 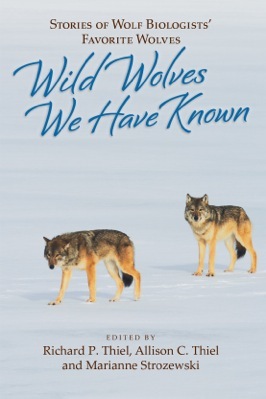 They are threads of determination and resilience by author and wolf alike that help us understand the lives of wolves and in turn examine our own commitment to coexist with wildlife.” —Kim Wheeler, Executive Director, Red Wolf Coalition, Inc.
Buy it now All royalties benefit programs at the Center. Edited by Richard P. Thiel, Allison C. Thiel and Marianne Strozewski.